So, if the length of your passwords is only one character, you will only have 2 possible passwords: A or B. That’s going to be pretty easy for a hacker to guess, right? Now, if you make that longer, say you increase it to two characters, it’s going to be slightly more difficult to guess, as there will now be 4 possible combinations. Still easy, but definitely harder than a password with just 1 character. Let’s increase that length some more and make it 3 characters. Now, there’s going to be 8 combinations. See what I’m trying to drive at? If you have 4 characters, that’s going to be 16 combinations, and so on and so forth. The longer the length, the harder it’s going to be to crack. Of course, these hackers are going to be armed with applications and machines that will make password cracking much faster. Still, if you’re going to use the full 26-letter alphabet, a length of say 8 characters will already amount to 208,827,064,576 combinations. Make it even longer, and, eventually it’s no longer going to be feasible for a hacker to crack a single password. 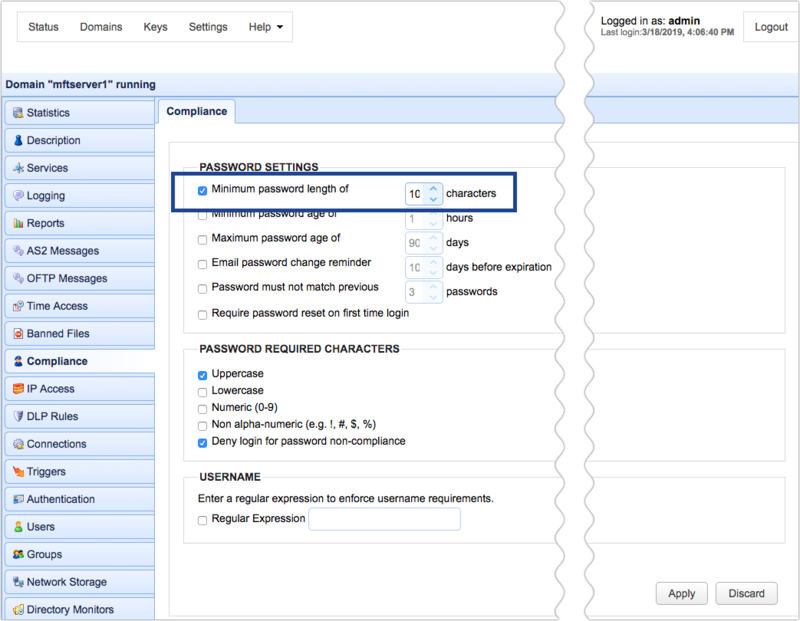 So, how do you force users to use long passwords in JSCAPE MFT Server? Easy. Just navigate to a domain, go to Compliance, set a minimum password length, and click Apply. You can also check ‘Deny login for password non-compliance’ so that users who haven’t changed their passwords yet to adhere to your password length policy (even if they enter the correct password) won’t be granted access.